Recently I interviewed a new grad from one of the public universities in the Dallas area. Of particular interest, this individual told me that the first comm class of every morning started with a current events quiz. The purpose of this exercise is to prompt students to read a physical newspaper every morning, since that’s probably the best way to gain a broad overview of what’s happening in the world – and to score well on the morning quiz! Some might say this exercise is a relic of times gone by, especially in light of research indicating that half of Americans get their news from Facebook and 10% of Americans think Facebook is actually a news outlet. Anything that gets students – and adults – reading and learning about issues in the world around them is a good thing, but I wonder what we’re losing in terms of knowledge with the decline of print media. There’s the immediacy factor. When news happens, boom, it’s right there in multimedia, so we read, see and hear about it, not only from news sources, but from those in our social networks. The presentation of news online also offers outlets the ability to incorporate interactive graphics to help explain the story in a way that amplifies – or even replaces – the narrative. There’s the general notion of a news encounter. We’re online, scrolling through our Facebook feeds, and interspersed with a photo of a friend’s lunch are news items that we might not otherwise have scanned. There’s the consumption of news itself. With so few Americans subscribing to news – either in print or online – the availability of information provides access to news that individuals otherwise might not seek out. And of course there’s an environmental benefit, with less paper being used to produce a print product with an extremely short life span. But what do we lose with the move away from print? We lose the pass-by effect that comes with reading a physical newspaper. We may not read every article, but by flipping through the pages, we’re taking in all the headlines as we evaluate what we want to know more about. So even without reading a story, we’re gaining topline knowledge of key issues or items considered important or relevant enough to put in print. We also lose a depth of information. With all the events occurring around the world, we shortchange ourselves by not delving deep enough into the facts, implications and analyses. The convenience of a snapshot in our Facebook feeds can never compensate for that level of detail. Encountering news – a benefit of online news consumption – also is not the same as following news. Stories and events often play themselves over time, revealing new layers and nuances that help us form opinions. And finally, as the success metrics for media have become more focused on eyeballs and click-throughs, media are presenting stories online with which consumers have the propensity to engage. Sometimes, what consumers want to read, and what they should read, are vastly different. Knowledge is cumulative. It builds over time through repeated exposure to facts and opinions, and we build our understanding through context and various points of view. A well-written article – whether in print or online – teaches you something. It might present something familiar from an unfamiliar angle. At the end of the day, I’m not giving up my newspapers, although after the morning read, I’m constantly online, consuming news from these same outlets in their digital counterparts. 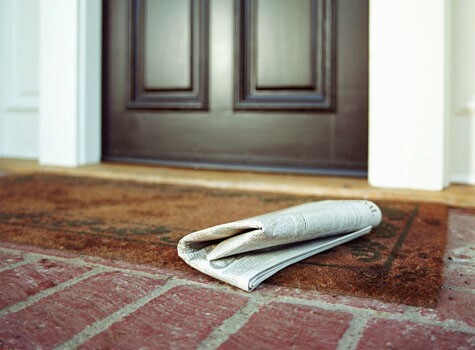 News outlets deliver the world on your doorstep, so open the door and start reading!